Zack Snyder's Justice League was a real turning point for the DC Extended Universe. Snyder, who had to step down during filming due to the sudden death of his daughter, was replaced by Joss Whedon, who helped wrap production and complete extensive reshoots. Upon the film's release, it had a polarizing effect on fans and critics alike, many of whom were left calling for the release of Snyder's directors cut. However, while we may never see the "Snyder Cut" of Justice League, filmmaker, writer and avid comic book fan Kevin Smith recently spoke with crew members who worked on both Snyder and Whedon's version of the film in London during Smith's visit to the set of Star Wars: Episode IX. During the discussion, they shared details about where Snyder had planned to take the franchise, which was apparently the first part of a planned trilogy. According to the crew members, they saw storyboards drawn by artist and current co-publisher of DC Comics Jim Lee, which detailed the events for all three movies. Justice League was more or less the same movie we saw, with the League uniting, resurrecting Superman and fighting Steppenwolf and his Parademons. The only major difference is that at the end, when Steppenwolf was defeated, we would have seen his commander, the tyrannical ruler of Apokolips known as Darkseid, look on at the League through the Boom Tube portal before it closed. The sequel would have had the League leave Earth and travel to Apokolips to confront Darkseid, leading to a colossal battle that would most likely involve New Genesis, Darkseid's rival planet and home to the New Gods. The battle would have involved the Green Lanterns, as well, who were apparently supposed to be referenced in Justice League beyond the brief flashback cameo. In fact, originally, Jeremy Irons' Alfred was talking to Green Lantern, not Superman, when he said, "Let's hope you're not too late," in one of the film's trailers. The crew had even shone green light around Alfred to simulate the glow from Green Lantern's power ring. Despite the heroes' best efforts, the film would have had ended with the League defeated and Darkseid coming to Earth, where he "levels it." 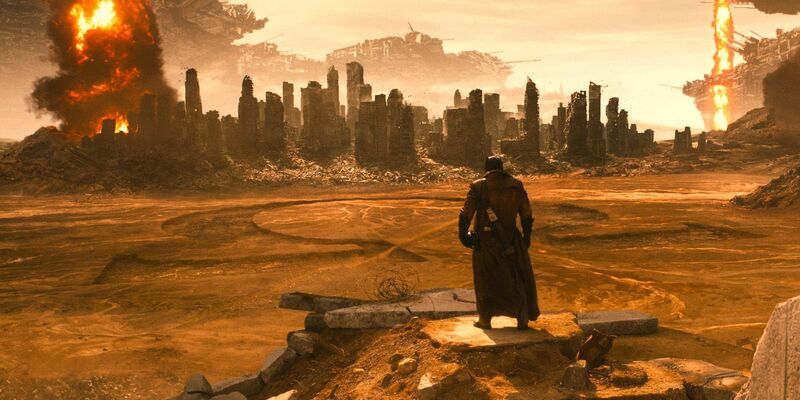 The end of the trilogy would have taken place in the post-apocalyptic world Ben Affleck's Bruce Wayne saw during the Knightmare dream sequence in Justice League. With their world decimated, the League would have gathered together one last time for their final stand against Darkseid and his Apokoliptian forces. With the usual content we'd expect from Smith's enthusiastic interviews, the filmmaker sums up the obvious at the end. "I really feel like hearing what we heard, we might have missed something."